Found a great guy but afraid of losing him? Was everything rosy until he started to pull away? How can you lock a man down, so you will never lose him? Perhaps it was something you said or did. Perhaps he’s losing interest because you’re “getting boring”. Or perhaps for no reason at all you’ve started to fear losing him. 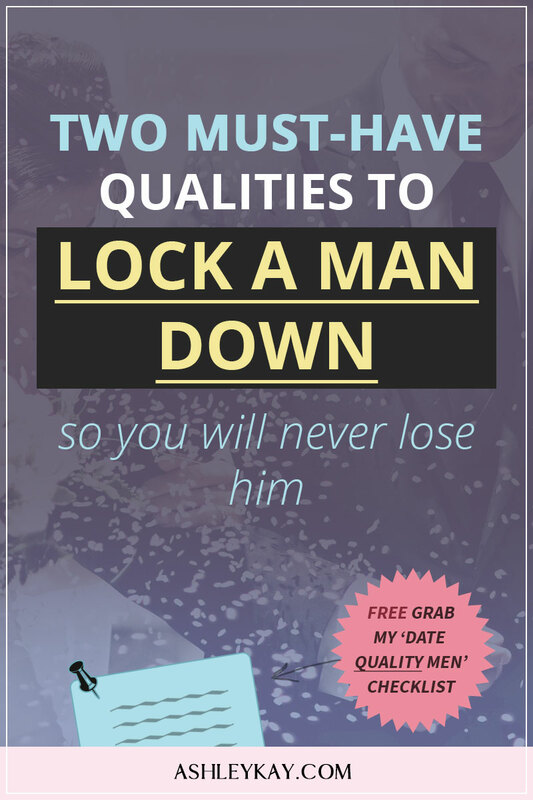 This week I want to share with you TWO Must-Have Qualities that will help you lock a man down for good. These two qualities are so important, it could make a ginormous difference to the overall quality of your relationship. It could completely change the way a man sees you and treats you. These qualities are also inherent in every woman – so you already have it within you. Its powers are extraordinary in turning around even the most “hopeless” situations. You can go from losing a man to get him chasing you in literally minutes! Huh? You’re probably thinking, courage? Yep. Courage is doing something even when you are SCARED to do it. If you do something but you’re not scared to do.. then you’re not using courage. To bring out true courage, you MUST be scared at the same time. The two can not exist without the other. The first job interview you ever did. The first time you told a boy you loved him. The first time you spoke in front of a large crowd. Being on a rollercoaster ride. The first time you confessed to something you were ashamed of. Courage appears during your “firsts” of things, but it doesn’t have to be. Some people are always scared before doing a speech. Some people are always scared to say “I love you”. Some people are always scared before a job interview. Perhaps “scared” isn’t the word you would use. You could replace the word scared for nervous, anxious, uncomfortable, dislike… or just something you want to avoid and not think about. Now there is one area where Absolute Courage is crucial to its success – that is in your Romantic Relationship. Open up emotionally to someone knowing they could hurt you. Speak what is truly in your heart – even if it means losing that other person. Give love to another person even though they’ve hurt you. Walk away from someone even though it hurts you deeply. Real love is not exactly a stroll in the park. Not where the chance of being hurt exists. I know I should open up. I know I should put myself out there. I know I should allow myself to be vulnerable. I know I should leave him. I know I should stop talking to him. Knowledge isn’t the problem. We all know what we need to do. The problem so many women lack is Absolute Courage. The courage to face those fears, step out into the unknown, say the words “yes”, “no” or “this is how I feel” when we are SCARED TO DO IT. What are we scared of? I know what I was scared of. Not being accepted. Not being liked. Being rejected. Not getting the approval I wanted. Not feeling loved. Feeling abandoned. These feelings are not small change. They’re real and big and can emotionally affect you for weeks, months, sometimes YEARS. It’s like the sadist in us wants to hurt ourselves and continue hurting ourselves. We keep us locked in torment by replaying the same failures, hurtful moments, abusive words that cut us to our core. It’s not easy. It never fully goes away. You will always have moments when you doubt, feel like a failure, want to crawl under the covers and never see another soul again. And most people deal with it by putting on their blinders and pretending “everything is fine” and “they are strong”. Unfortunately, the problem with this approach is you shut down your ability to exercise Absolute Courage. And you NEED it if you want a fulfilling, passionate, deeply enriching relationship with another soul. Just as you can’t climb to the top of the mountain without aches and pain. Just as you can’t get a job without forcing yourself to go to job interviews where you’ll be rejected. Just as you can’t experience any of the joys of life by staying cooped up in your house 24/7 and pretending all is ok. But trust me when I say, the more you practice Absolute Courage, the easier it gets. Each time you get hurt you get a bit stronger, you get a bit more resilient, you are one step closer to your goal. It’s like going to the gym and lifting weighs. Exercise is meant to hurt. If it didn’t hurt, you weren’t doing it right and you won’t get results! In your relationship, you’re working out your “Love” muscle. But it’s not the “Love-Him” muscle, it’s the “Love-Me” muscle. Oh yes, I’ll give him more. I’ll do more for him. I’ll try harder for him. THEN he’ll love me. They equate giving love to a man to receiving love for them. But it’s NOT working. Ladies, reciprocity is a FEMININE trait – not a masculine trait. 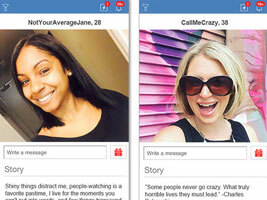 Watch women with other women, there will be equal sharing back and forth. Women naturally understand this. Men are about dominating, taking, controlling and molding their OWN universe. Men are natural competitors. They don’t play fair because playing fair often means you’ll get screwed over by the other guy. And women are ATTRACTED to this because men are so different from us. If you want a man’s love the way that WORKS, you must work out your “Love-Me” muscle. Have the courage to stand up for yourself. Have the courage to speak what is in your heart. Have the courage to tell a man what is and what isn’t ok. Have the courage to walk away if a guy won’t or can’t give you what you want. Have the courage to LOVE yourself when your man is not loving you! When you love yourself with courage, a man who already cares about you will only love you more! A woman is the heart of any relationship. She’s the one who teaches men how to love, how to be soft, how to be nurturing and truly listen and care. That’s her gift to him. But she has to do this by the way she loves herself – she must lead through her actions; by the high standard she holds herself to, by the way she respects herself. NOT by what she does for him. I’m not talking about being honest with other people. That’s only one part of the equation. I’m talking about being honest with the self. When you’re alone, in your room, in your thoughts, what do you say to yourself? Are you honest with yourself? Or do you sugarcoat things, or lie, or try to avoid, or downplay certain issues, or play up other issues? When a woman is unhappy with her weight, what are the chances she even knows what her weight is? I know my scale will sit and collect dust for months when I’m not eating healthy. I don’t want to see the number. I know it’s not good, so why subject myself to that? Or when I’m not feeling pretty or confident, I avoid mirrors as often as possible. I’ll take a split second look, feel crappy and look away. No one wants to look at that. Including me. When a relationship isn’t working out, what do most people do first? Avoid it. It has given rise to terms like “ghosting”, “slow-fade” or “stone-walling”. This is when one partner will avoid the other one as much as possible. They’ll stop calling, stop answering, hang out with friends, suddenly go on more business trips, suddenly be super busy with work etc. And if you bring it to their attention, they’ll lash out at you for being inconsiderate and blame you. Which is just another “avoidant” tactic. Yes, if a problem is too hard to solve, the best solution is to avoid it until it just “goes away on its own”. The evil thing about this is just how well it works. You can very quickly and easily trick yourself into believe all is well, you’re happy and life is great. My partner recently went through a tough period financially. Unfortunately, he also racked up a ton of parking tickets as well. This is very unlike him. He is usually good with money and on top of his bills. I didn’t blame him though because I knew why he did it. He didn’t like his financial situation, so he avoided the bills as they came. Unfortunately, there are penalties to avoiding bills – just as there are penalties in life for avoiding… just about anything. Absolute Honesty is hard to maintain on a consistent basis. But it’s the first step to improving ANY situation you’re in right now. Job not where you want it to be? Take a look at why. Be honest about it. Not happy with your appearance? Take a look at why. Be honest about it. Not happy with your relationship situation? Take a look at why. Be honest about it. Absolute Honesty is not about punishing yourself. It’s about learning to LOVE yourself regardless of what that truth may be. You don’t have to “like it” but you do need to accept it and be ok with it. Being honest is telling yourself you need to lose weight, doing something about it and accepting the results as they are. You don’t need to go complaining to every person you see. But you DO need to acknowledge the truth to yourself. You need to tell a guy how you really feel. You need to ask for what you want. You need to acknowledge your behavior and its affect on your man. You need help with attracting and keeping a quality man (instead of losers). You need a plan to increase your self-esteem and gain men’s respect. Now, something magical happens once you acknowledge there is a problem. When you register with your super computer – your BRAIN – you have a problem, your brain will automatically go searching for a solution. The solution may not come to you straight away. You may need to do research. You may need to talk to people. But a solution will eventually come to you. By acknowledging the problem, you’re giving yourself the chance to fix it. This is wildly empowering. It will surprisingly make you feel BETTER about your problem. Because you know you’re no longer avoiding it, you’re doing something about it. You can face and prepare for change. Why do I really feel this way? How am I giving love to myself lately? What can I do about this problem that is solely in my control? What am I really unhappy about that is within my power to change? Have I really being taking care of myself lately? Have I really being trying hard to make this work? It’s the more difficult problems we tend to avoid. I suggest you tackle your difficult, most lingering problems first. The mere fact you’re doing something about it will instantly feel as if a weight has been lifted. The quality of your life and relationship will come down to how honest you are with your problems. As much as we can, we should incorporate these two qualities into our lives. Absolute Courage and Absolute Honesty. Especially if you continue to struggle with men.